0 A.D. will be free, multi-platform and open source and the first alpha version should be released by Wildfire in July 2010, however SVN snapshots for Ubuntu users are provided by PlayDeb.net so all you have to do is add the PlayDeb repository (click here to download a .deb file which will add the PlayDeb repository) then simply click HERE for a 1-click install. The game has been recently rewritten and because of this, only the single-player mode is active for now but this should change really soon! Please note that I didn't play it for too long so I'm not sure how complete the single-player mode is. However, for a pre-alpha version, the 0 A.D. looks great so far! 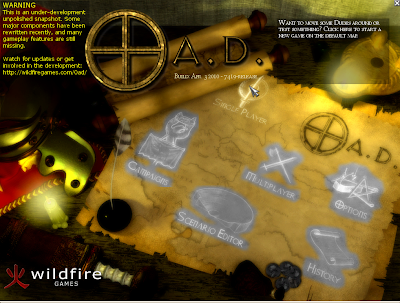 To download the source code as well as Windows and MacOS X binaries, head over @ 0 A.D. website. And speaking of Wildfire, there is currently a campaign called the Humble Indie Bundle - a pay-what-you-want (any price whatsoever), DRM-free bundle of 5 great indie games worth US$80. You can also set how much to give to the developers and how much to charities. And an interesting fact: so far the Linux users paid the most for the indie games.